We got a call from a very upset hunter on Monday night. He and his friend were hunting grouse. A brown phase ( x between a red and a gray) Screech Owl flew out from a tree and he mistook it for a grouse. The only good news was they knew they had made a BIG mistake. They collected the little guy and brought him into REGI for care. That act was honorable on their part. They could have left him die in the woods, as less responsible hunters may have done. He is stronger this morning. 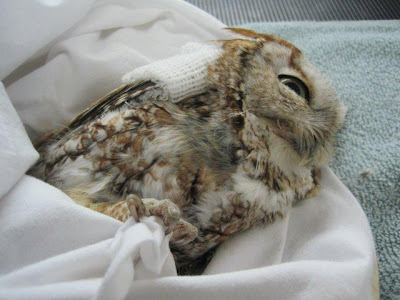 Unfortunately grouse, and therefore this Screech Owl ,are often still hunted using lead shotgun load. 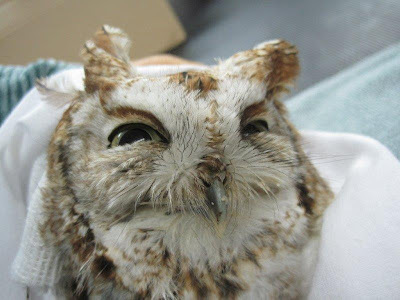 If the Screech Owl has retained any of the lead pellets he could well suffer from lead poisoning as well. We will have to monitor him for any neurological problems that may indicate lead toxicity. The incident was a teachable moment for the young hunter and his friend. I think it may change any casual approach to the sport in the future for them. We were able to give them information about lead poisoning in hunting and some lead alternative fishing tackle to make them aware of that issue too. 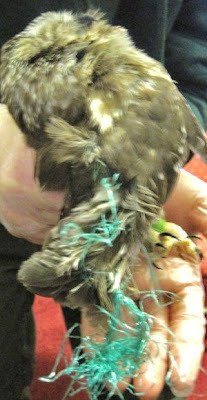 The Saw-whet Owl that was admitted unresponsive on New Years Day, has made wonderful progress. 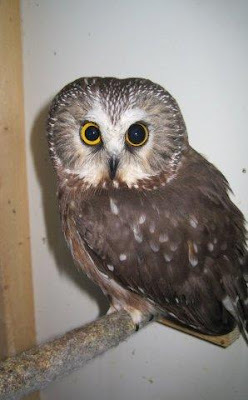 She is flying and is back to being a normal Saw-whet Owl with the exception of having some vision loss in her left eye. We are still waiting to see if the eye will recover, but it is not likely. There have been studies done on owls with vision loss in one eye and they are encouraging that they can still be released with good success in the wild. Unlike hawks and eagles, owls use their hearing more than vision when hunting. We will continue to evaluate her. Have a wonderful day everyone! Happy Birthday to our wonderful volunteer Lil Tower! Good luck Mr Screech Owl!!! I'm glad to hear the Saw-whet is doing better. I am a lucky guy to have lived once, at an appropriate distance, with a Saw-whet and I know what wonderful creatures they are! Thanks for caring for all these magnificent birds. the hunter did the right thing. thank goodness, that was wonderful to hear!